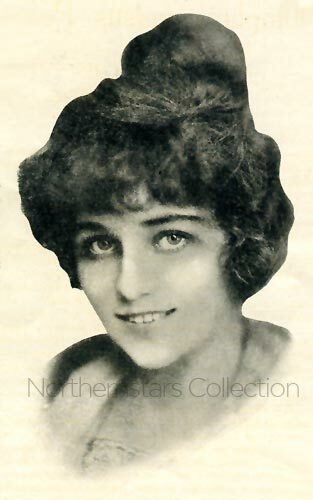 The images of Florence Lawrence (l) and Mary Pickford © were scanned from originals in the Northernstars Collection. (August 17, 2010 – Toronto, Ontario) Biograph is the abbreviated name commonly used for the American Mutoscope and Biograph Company. Incorporated in 1895 by William Dickson, an inventor who had previously worked for Thomas Edison, it developed into one of the most active forces in the formative years of American cinema. By 1909 it was known simply as the Biograph Company and its studios at 11 East 14th Street in New York City were the spawning ground for such formative talents as D.W. Griffith, Mack Sennett, Lillian Gish, Blanche Sweet, Mabel Normand, Lionel Barrymore and Mae Marsh. Biograph’s stock company of players also included three Canadian beauties – Florence Lawrence, Mary Pickford and Florence LaBadie. Florence Lawrence (born Florence Bridgwood in Hamilton, Ontario, 1886) was, according to Ephraim Katz’s authoritative The Film Encyclopedia, “the most popular actress at the Biograph studios and one of the great stars of the early American screen.” At the time of her tragic suicide at the age of 52, Mary Pickford wrote: “She was by far the best actress in the early days of Biograph.” On stage and touring with her mother by the age of three, Lawrence joined the American Vitagraph Company at 21 when the touring company disbanded in 1907. There she appeared in 38 films, including an early screen version of Romeo and Juliet as Juliet. But it was with Biograph that she made her lasting mark, and her rise was meteoric. Her first film was Betrayed by a Handprint, directed by Griffith in July 1908. He liked her so much that she appeared in virtually all of Biograph’s films over the next 18 months, 114 in all (106 directed by Griffith), before she signed with Carl Laemmle’s Independent Motion Picture Company of America at the end of 1909. Since it was the Biograph’s policy not to promote actors lest they demand more money, Lawrence was simply known as “The Biograph Girl.” At the Independent Motion Picture Company she became known as “The IMP Girl,” and thanks to one of Laemmle’s outrageous publicity stunts – he claimed she was killed in a traffic accident, then, after gaining media attention, placed ads in the newspapers with a photo of Lawrence declaring she was alive and well and making The Broken Oath, a new movie for his company – she became the first star to be known to the public by her real name. However, due to an accident on set while working at the Universal Studios, in which she was badly hurt and burnt, Lawrence’s career was effectively over by 1914. In the 1930s she was put on the MGM payroll as an act of charity, drawing a small salary and being used occasionally as an extra. She eventually killed herself by eating ant paste on Christmas Day, 1938, alone and forgotten. Mary.” In January 1910, Griffith moved his company to Los Angeles in search of a more favourable climate to shoot his films, far away from the New York winters. 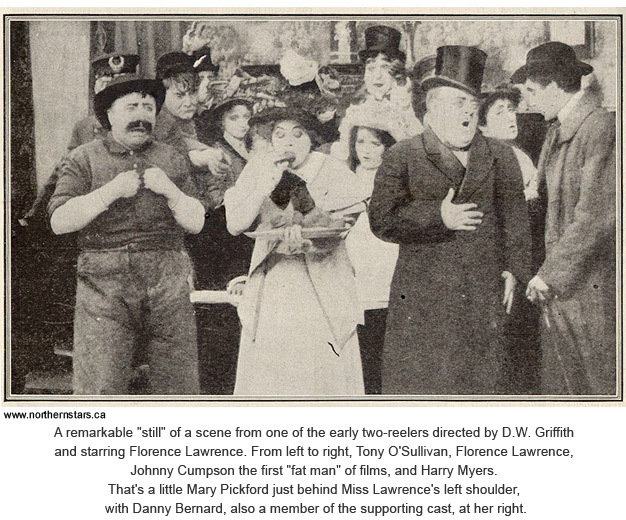 The 17-minute Ramona, with Pickford, her brother Jack, and fellow Canadians Mack Sennett and Dell Henderson, is considered to be the first film shot on the West Coast. When Lawrence moved on from IMP at the end of 1910, Laemmle hired Pickford away from Biograph, but she returned briefly in 1912 to make another 37 films for the company. Her last, The New York Hat, directed by Griffith and also staring Lionel Barrymore, Lillian Gish and Mae Marsh, is generally acknowledged as her best from this period in her career. She then signed on with Adolph Zukor’s Famous Players Company (which later became Paramount) where, as “America’s Sweetheart,” she became the most popular and financially successful woman in screen history. With her charm and child-like beauty, Pickford had international appeal. At the height of her fame, her “Little Mary” character rivalled Charlie Chaplin’s “Little Tramp.” Later in life she became alcoholic and, unhappy with the overall quality of her work, threaten to burn all her films before she died; however, she had a change of heart and donated them to the American Film Institute. Six months prior to her death in 1979, she applied for and got her Canadian citizenship reinstated. A historical plaque marks her birthplace on University Avenue in Toronto. This image was scanned from an original source dated March 2014 now in the Northernstars Collection. Click to enlarge. possibly the most beautiful and talented – and least known – of the Canadian women at Biograph, LaBadie was working as a fashion model in New York when she was introduced to Griffith by her friend Pickford. 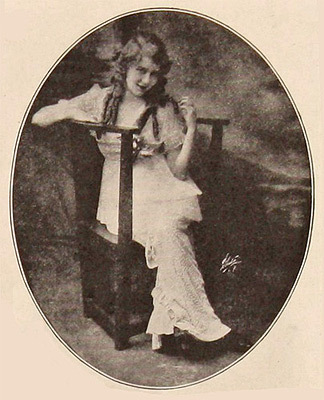 LaBadie appeared in 37 films for Biograph from 1909–11 (four with Pickford; two with Lawrence), the first being The Spanish Gypsy in March 1909. She then moved on to the Thanhouser Company, a smaller studio located in New Rochelle, New York, where she became its leading lady. LaBadie’s fame and beauty was so great she attracted the attention of Woodrow Wilson, then the governor of New Jersey (later president of the United States), who was rumoured to have been her lover. She was under contract to Pathé when she suddenly died at 23, six months following an unfortunate car accident. At the time of her death, Marie Russ, a patient at the Home for Incurables in New York City, came forth to claim Florence as the child she gave up for adoption. However, the validity of this claim was never proven. This article was written for Northernstars.ca by Wyndham Wise, the former publisher and editor-in-chief of Take One: Film in Canada. It is Copyright © 2010 and may not be reproduced without prior written approval. Click here for more information about copyright. Originally published in 2010, the information we now have about Florence La Badie differs substantially from some of the details used in this exclusive article. We have chosen to leave this article as it was originally written since it links directly to a page that has what we consider to be more accurate content.